Raphael from Teenage Mutant Ninja Turtles. Features classic black and white design! Entertainment Earth Exclusive! Raph in black and white! From the creative minds of Funko and Playmobil, comes a collaboration meant to be collected. From Teenage Mutant Ninja Turtles, this Raphael figure combines Funko's take on the classic character with Playmobil's iconic body design. 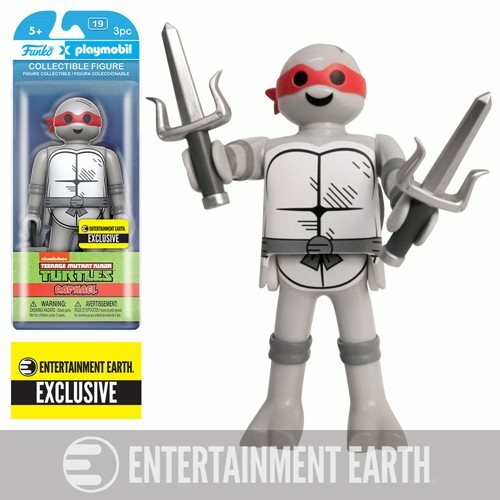 This exclusive Raphael also features the Turtles's original black and white coloring, with a red bandana! He also includes his signature twin sai weaons! The Teenage Mutant Ninja Turtles Raphael Black and White 6-Inch Playmobil Action Figure is also scaled up from the traditional Playmobil size and measures approximately 6-inches tall, packaged in a blister card. We reserve the right to limit quantities ordered. Ages 5 and up.